Young Mr. Washington’s fro is to die for! Although there is a striking physical resemblance between John David and his father Denzel, I am utterly amazed at how close their voices are to each other. The smooth canter of cadence is mesmerizing in similarity. I had to pull up John David Washington’s IMDb to see if he had been in anything prior to this. I chuckled to see he played a student in a Harlem classroom in his father’s Malcolm X in 1992 (he was around 8). Then I did an approving nod to see that he was a co-producer on (also his father’s) The Book of Eli. There are three movies prior to this in which he had smaller acting roles and I believe he played a part in Ballers (no incline to watch that show so it will be a hard pass on that). I now want to watch the movies to see if he stands out in any way. He is truly exceptional in his ability to convey emotions through his expressions. I look forward to his future roles. I have also watched him in interviews and enjoy seeing his turning a “how is it being the son of…” questions back to his equal respect and love for his mother. I had never paid real attention to Adam Driver until this movie. I watched him as Kylo Ren and felt that he was underwhelming in that Star Wars role. He certainly made an impression on me with this film. I could feel just how uncomfortable he was. I really hope he gets the Supporting Actor nod when Oscar noms are made known. His character had a bit of a longer arc – starting with his unwillingness to play the part of redneck and then his realization that he ignored his own personal culture. It made me think of a butterfly – cocoon to wing. Because of the “duplicity” of the character (and intent) of Ron Stallworth (the on-the-phone persona and the in-real-life persona), these two versions of the same person were like watching a choreographed dance. I think the chemistry between the actors made it feel believable. Husband looked at me and said “Steve Buscemi? ?” And I was like “yeah!? !” But when I pulled up the movie I realized that it was not Steve but, in fact, his brother Michael! What a talented family that must be! He offered comic relief throughout the film. Finally, Topher Grace. I watched interviews with him in which he tells of having a new baby during the filming of the movie and the difficulties he faced playing such a vile human and then having to come home to hold a beautiful, innocent child. David Duke – the man who still tries to insert himself into a hate-fueled spotlight. How is it that he is still relevant… oh, yeah, I know. The movie made me so uncomfortable. So pained to see people treated this way. The language hurt my ears and made me realize that I cannot begin to fathom the hate spewed without provocation or merit. When the movie wrapped and the film moved to Charlottesville I cried. Even now, I tear up at the thought of it. This is “how far” we have come? And how far is that? Not far at all, not far enough. My takeaway from Ron Stallworth clips: He LOVES the Cubs. On the interview below, do yourself a favor and skip to 2:31 and watch the corrective measure John David takes in this interview to explain the importance of being the “son of” not only Denzel but his accomplished mother, Pauletta Washington. IMDB Synopsis: Ron Stallworth, an African American police officer from Colorado Springs, successfully manages to infiltrate the local Ku Klux Klan branch with the help of a Jewish surrogate who eventually becomes its leader. Based on actual events. I rank this movie a 98.23! It received a Rotten Tomatoes rating of 95% Fresh. It received a Rotten Tomato audience rating of 82% liking it. Average Rating: 4/5 with a number of User Ratings: 7,105. The real Ron Stallworth had originally wanted Denzel Washington to play him, but was ecstatic to find out his younger son got the role. Director Spike Lee and his writers moved the story back seven years from when it actually took place in 1979 to 1972. This allowed the film to reference both the then trendy blaxploitation movies and the re-election campaign, supposedly supported by the Klan, of President Richard Nixon. Actor Topher Grace said in an interview with IndieWire, that portraying David Duke left him feeling depressed, so as an act of catharsis he took on the project of editing Peter Jackson’s trilogy of films based on The Hobbit into a single two hour movie. This film contains clips from D. W. Griffith’s silent movie The Birth of a Nation. While Spike Lee was a student at NYU Film School, he was so outraged that his NYU Film School professors taught The Birth of a Nation (1915) with no mention of its racist message or role in the Klan’s twentieth-century rebirth that he made a student short film titled The Answer (1980) as a response. The film so offended many of his professors that Lee was nearly expelled from NYU. He was ultimately saved by a faculty vote. After Lee’s film industry successes, he became a professor at NYU Film School, serving as the Artistic Director of the Graduate Film Department. The film featured the late musician Prince singing “Mary, Don’t You Weep” over the end credits. This was a previously unreleased live rehearsal recording. The film is dedicated to the life of Heather Heyer, who was fatally hit by a car while protesting the “Unite the Right” rally held on August 12, 2017 in Charlottesville, VA. The film opened in the US on August 10, 2018 to mark the one-year anniversary of the rally and her death. This film depicts D. W. Griffith’s The Birth of a Nation being screened at a Klan ceremony during the 1970s. This is an accurate representation of how the modern Klan really did still use Griffith’s century-old, silent, black-and-white movie for propaganda purposes at least into the early 2000s. In his 2002 book “THEM: Adventures with Extremists,” Jon Ronson recounts his visit to a KKK compound in Arkansas for their annual National Congress meeting. After a variety of racist speeches and a cross-burning, the Klan members enjoyed a screening of The Birth of a Nation. 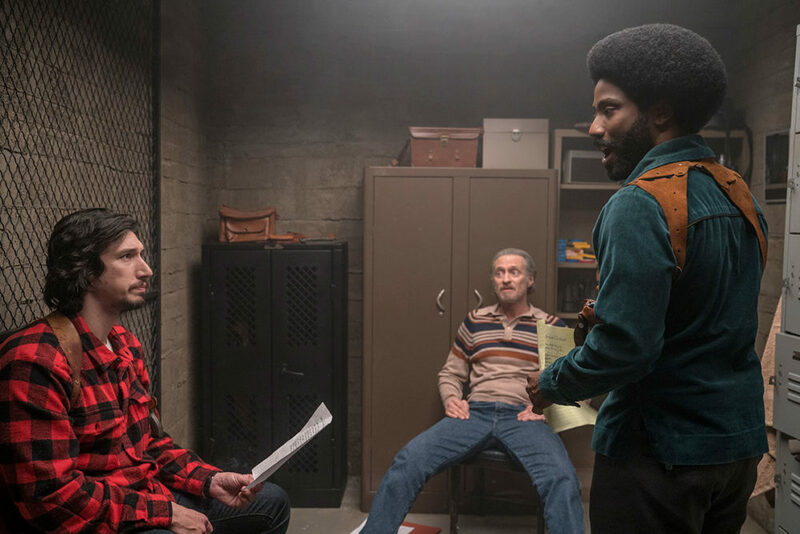 BlacKkKlansman (2018) premiered on May 14, 2018 at the Cannes Film Festival, where it competed for the Palme d’Or and won the Grand Prix. It was theatrically released in the United States on August 10, 2018, coinciding with the one-year anniversary of the white supremacist Unite the Right rally. David Duke did not discover that Ron Stallworth was a black man until 2006, when a Miami Herald reporter contacted him for his side of the story. 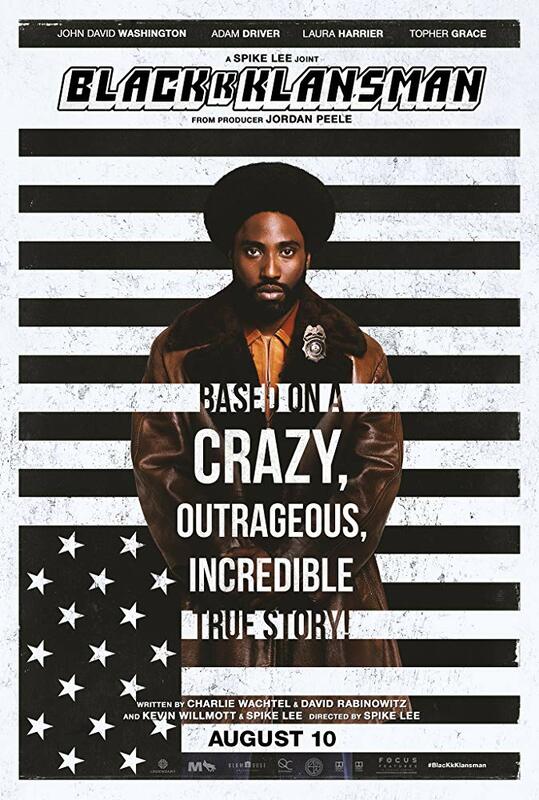 At a post-film cast Q&A on August 11, 2018, actor John David Washington revealed that right before his character’s post-KKK gun shooting scene was filmed, director Spike Lee told him that the metal targets depicting black men running were not props and that they were purchased on the Internet. Washington said filming that scene with that knowledge affected his performance. The final shot is of an American flag in black-and-white, depicted upside-down. In the USA, hanging a flag upside-down is a signal of distress or emergency. When used as a sign of protest, it is meant to signify political or civic distress.